The strong interactions, the forces responsible for the interactions between quarks and notably supposedly responsible for quark confinement, profited from the development of gauge theories. In the wake of the gauge theory of weak interactions also a gauge theory of strong interactions was formulated and investigated. An important step was taken with the establishment of asymptotic freedom for the gauge theory of strong interactions. 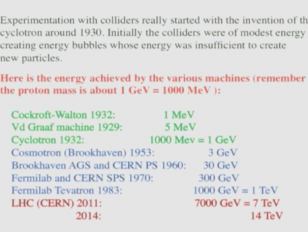 By 1980 the Standard Model of Weak, em and strong interactions was settled; the Higgs sector of that model remains still to be tested, which hopefully will be done at least partially using the new machine L(arge) H(adron) C(ollider) at CERN, now running. Meanwhile, CERN has been producing results. These include events that could be interpreted as evidence for a Higgs particle of approximately 125 GeV, that is about 133 times as massive as the proton. The relevant events observed could be interpreted as one of the following three types: Higgs decay into two photons; Higgs decay into two Z (the neutral vector boson of the weak interactions) of which one is virtual; Higgs decay into two W (the charged vector boson of the weak interactions) of which one is virtual. More data will be needed before any firm conclusions can be drawn; that could be somewhere during the next year. The latest results will be discussed.